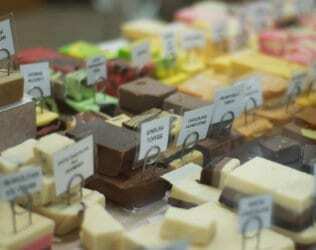 A trip to Montville is never complete until you have paid a visit to fudgyboombahs, the Home of Montville Fudge. First established in 1996, the store prospered as one of the Granny Mac fudge outlets. 3 years later, the store morphed into Olde Auntie Maureen’s Montville Fudge Factory, and operated under that banner for the next 9 years. During this time, a reputation grew for arguably the finest fudge for miles. Greg and Gayle Jones saw huge potential in this reputation. And so, in 2008, Olde Auntie Maureen’s was sold to them, and a short time later, fudgyboombahs was born. It’s reputation has grown to such an extent, that fudgyboombahs was recently voted “Most Popular Business” in Montville. Greg and Gayle are well qualified as business operators, with a vast background in the Transport Industry. Sub Contract Owner Drivers for over 18 years, they realised that age was beginning to creep up, and a less physical occupation appealed. Both are artistically minded; Gayle is a Qualified Florist, and Greg spent 12 years in Graphics. fudgyboombahs allows them to indulge their artistic talents no end. It’s now over 6 years since fudgyboombahs was born. There are now dozens of new fudge recipes. Most new ideas come from fudgyboombah customers. While Gayle usually works behind the scenes literally whipping up hundreds of kilos of excellent fudge, Greg revels in the adulation his customers shower upon him, and his very capable staff. Now a new chapter is opening. A state-of-the-art website, complete with online shopping facility, is now live. Customers will be able to browse, then purchase from the fudge cabinet 24 hours a day, 7 days a week, without leaving home. All of fudgyboombahs many loyal customers hope that this innovation will see fudgyboombahs success continue well into the future.